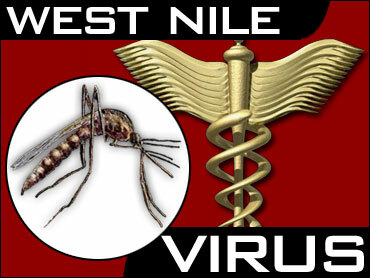 Vision loss, muscle tremors and numbness may be symptoms of the West Nile virus, according to researchers who are warning doctors and patients to be on the lookout as warmer weather and mosquito season approach. The neurological symptoms seem to mimic those of such ailments as strokes, Parkinson's disease and polio. "It can look like another disease but if it's summer months, they need to think about West Nile," said Dr. Nidhi Watson, a neurologist at Rush-Presbyterian-St. Luke's Medical Center. Watson and doctors from two other Chicago-area hospitals reached that conclusion after pooling information on 28 patients seen from August through October last year. More than half had unusual neurological symptoms. The 28 contributed to Illinois' nation-leading West Nile toll last year: 884 reported human cases and 62 West Nile deaths. Nationwide, there were 4,161 cases and 277 deaths as the virus spread toward the West Coast. The doctors prepared a report on the 28 cases for presentation Monday at the American Academy of Neurology's annual meeting in Honolulu. A high occurrence of neurological symptoms was found in West Nile patients hospitalized in Louisiana last summer. The federal Centers for Disease Control and Prevention is working to get the word out to doctors to be alert for those signs, said Dr. Jim Sejvar, a CDC neuroepidemiologist. Most people bitten by an infected mosquito don't become ill. About 20 percent will develop West Nile fever, which includes mild symptoms such as headache, swollen lymph nodes and a rash. The CDC estimates that less than 1 percent will develop a more severe illness characterized by encephalitis or meningitis, both neurological ailments. Encephalitis may involve headaches and confusion. Meningitis may also include severe headache, but also stiff neck, vomiting and sensitivity to light. The researchers found that neurological problems other than encephalitis and meningitis may also occur. Of the 28 Illinois patients, 15 - 54 percent - had symptoms such as vision loss, tremors similar to those seen in Parkinson's patients, muscle weakness or numbness. While nine of the 15 were diagnosed with meningitis or encephalitis, six never developed those ailments, said co-author Dr. Sidney Houff, neurology chairman at Loyola University Medical Center. Most patients had milder symptoms including fever about a week or so before neurological symptoms developed, but it was the more severe symptoms that prompted them to seek help. Houff said the study suggests such symptoms occur in a large number of patients, though the true incidence requires more research.